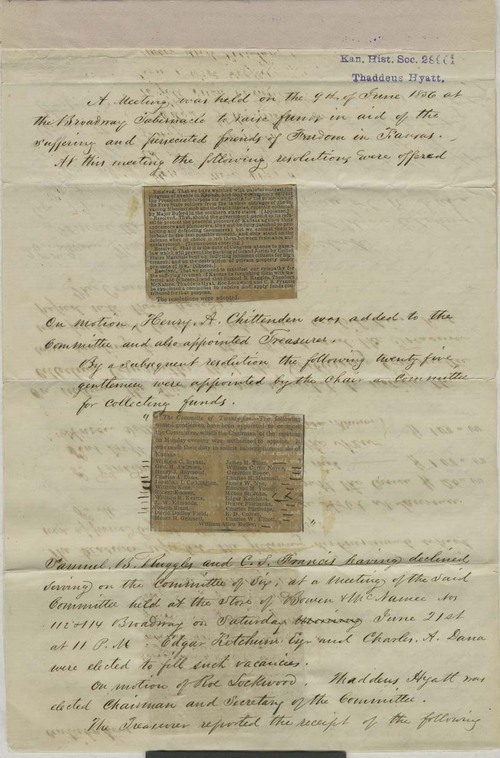 This document details the minutes of three meetings of the Kansas Relief Committee, otherwise known as the National Kansas Committee, held in 1856 on June 9th, June 21st, and June 26th. It also includes information about the membership of this emigrant aid company. The first of these meetings adopted resolutions to aid the plight of free-state settlers in Kansas Territory. Furthermore, the members of the committee decided to establish five thousand settlers in Kansas Territory and to give them a year's worth of provisions.